With only weeks left in the second quarter of 2015, it’s time to embrace some pre-summer excitement by taking a look back at quarter one. 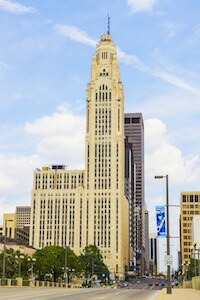 Despite a frigid start to 2015 for Columbus, Ohio, in which temperatures dropped to zero or even below zero at nights, the Central Ohio (especially Columbus) real estate market remained red-hot. And, if the above-average March 31 temperature of 64 degrees was any sign of good news to come in the real estate market, Columbus should get ready for a warming trend throughout the upcoming summer. Those were the findings (minus the temperatures) of a recent report on the State of Ohio’s commercial and retail markets. Often in economics, numbers or trends that move upward imply good news, i.e., rising incomes, increasing revenue, and an uptick in hiring. But good news comes in the other direction, too. According to the Q4-2014 Commercial Retail Report from Columbus REALTORS®, 2014 and 2015’s “downward” trends also paint an encouraging picture of Columbus’s unemployment rate, as retail vacancy decreased to 9.4% (a 122,237 square foot gain in occupancy) to round out the year. Equally encouraging, especially in Columbus, the office space rental rate per square foot ended 2014 at $17.46, second behind Cincinnati and beating out Cleveland and Dayton, respectively. Robust numbers such as these suggest the Columbus, OH real estate market is healthy, with the proper amount of vacancy and demand. As Ohio and the rest of the country transitions from winter to spring, the residential and commercial real estate market typically undergoes a seasonal awakening, too. Thus, with end-of-year data so strong, and the national economic picture continuing to improve — 2014 was officially the best year for US job growth in 15 years, with nearly 3 million jobs created — Central Ohio and the Midwest, in general, can expect these trends to continue. At The Robert Weiler Company, we’re committed to helping bring to fruition some of Columbus’s most exciting and innovative commercial land use projects, revitalizing a vibrant commercial core that continues to experience a spring rebirth all its own. With 75 years of community roots with three generations of Weilers at the helm, whether it’s volunteering our time at Upper Arlington Lutheran Church – as some of us did last quarter, or helping fill the residential and commercial real estate space at Highpoint on Columbus Commons (the former site of the Columbus City Center Mall), you can expect the same level of dedication and local pride in the year ahead. We may be almost halfway into 2015, but spring is the real season of new beginnings, especially for the Columbus real estate market; The Robert Weiler Company is eager to help new commercial development projects blossom.